LAST UPDATE: Saturday 31 December, 2016. Calvin has posted his article on AFL.com.au along with the prices for the Power. Essendon defender Mark Baguley says that number one draft pick Andrew McGrath (DEF/MID, $250,000) has been doing all of the right things at training. He was unable to say whether he would play round one as they haven’t done any match-play stuff at training yet, but says he will “play some sort of AFL footy in his first season”. I think he is a lock for round one! Roy has posted his article on AFL.com.au along with the prices for the Demons. Both of Fremantle’s back up ruckmen, Jonathon Griffin and Zac Clarke have had set backs this pre-season. Griffin is nursing Achilles soreness and expects to be back with the main group after Christmas. Clarke has had knee surgery and is at least a month away from returning to the track. This is possibly good news for those keen to start with Aaron Sandilands (RUC, $450,000) at his discounted price. Warnie has posted his article on AFL.com.au along with the prices for the Magpies. Tbetta’s favourite ducking brother, Scott Selwood, has participated in a full pre-season after ankle issues kept him to five games last year. Jackson Thurlow says he is flying and we should look to see him absolutely dominate next year. Thurlow himself is back training and looking strong. Calvin has posted his article on AFL.com.au along with the prices for the Tigers. Only nominated ruckmen will be able to compete at a contest for a throw-in or ball-up in 2017. Other players will not be able to take part in a ruck contest as third man up. This will certainly need to be in our thinking as we select our ruckmen for the new season. Scott Thompson to move to half-back? At the grand age of 34 to start the new season, Adelaide’s Scott Thompson isn’t guranteed a spot in the best 22, but has been talked about playing a new role. The midfielder may spend some time playing off half-back and may be rested at times during the season. “We’re talking to Scott about maybe using him in another role as well, across half-back,” Pyke told reporters on Wednesday. “It’s not something we expect he’s going to be 100 per cent at half-back, but it just gives us some flexibility. “It’s unlikely we’ll see him play 22 games for us next year. Melbourne defender Herritier Lumumba has retired from AFL after struggling with repeated concussions. Roy has posted his article on AFL.com.au along with the prices for the Blues. Pig, and also Fantasy royalty, Tom Rockliff, has opened up to Pete Ryan at AFL.com.au about his horror year that saw him fall out of love with footy. It’s worth a read and hopefully the fantasy community are the lovers, not the haters. It’s going to be an interesting year for Rocky. Whether he’s captain or not, he’ll be having a crack to prove the doubters wrong. 25-year-old draftee Ryan Abbott has suffered a leg fracture in a marking contest at training. He will be sidelined until mid-January. Fremantle’s Shane Yarran, the mature-aged player who was taken at pick 61 in the 2015 draft, has retired after playing six games this year. It looks like Melbourne is set to play a fast-paced style of footy in 2017. Goodwin wants them to play with dare, energy and an attacking mindset. In a report from training, the aim was to move the ball quickly from one end to another. Definitely something to consider when we monitor their JLT Series games. If their aim is to move it too quickly, it may not be a Fantasy friendly style of play. 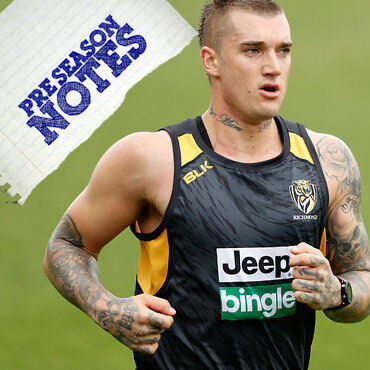 Dustin Martin lost DPP over the off-season after playing predominantly midfield in 2016, but he could be a good chance to pick it up again in the new year. Richmond forward line coach Justin Leppitsch was on radio on Monday saying the club’s boosted midfield division – Caddy, Prestia, Cotchin – would mean Martin would spend time forward. Warnie has posted his article on AFL.com.au along with the prices for the Suns. I wonder how close Dusty was to holding FWD/MID status. The new additions should see him float forward a bit more, but really, watching Dusty, he plays all over the ground. hey warnie, when does drawing board 2017 open? Chad at dtlive.com.au has been working on it. Not sure on the launch date, sorry! It seems to be open for DT (no Fantasy or SC yet). I think Dusty being a mid only is a good thing – will go someway toward eradicating the cookie cutter forward lines we see every year. Although, by the sounds of it he’ll have his dpp back by round 6. Aaron Hall is another that was a good decision. reckons hall will be an awesome pod if rocket doesn’t f**k with him. can average 115 if left to his devices. Agreed – let’s hope he’s worked on his defensive game over the pre season so Eade doesn’t drop him back to the two’s.